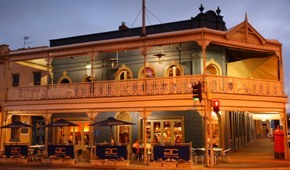 Located in central Ballarat, Golden City Hotel is an historical building, with a rich heritage, and a modern feel. The decor is fresh and clean, and there is a great atmosphere, with light cafe music. Golden City has a number of different dining sections. In summer, bi-fold windows open up, and there is pleasant outdoor dining as well as indoor. Patrons can eat as formal or informal as they like. With gluten free dishes marked on main menu, there is quite an extensive range available. The kitchen staff are flexible in their approach and many other meals can be adapted in consultation with the chef. A menu is available from their website (click link on this page). Golden City Hotel is renowned for having a wide variety of dishes available, and this includes gluten free options. Open for breakfast, lunch, dinner, morning and afternoon tea, the hotel offers great dining flexibility. Fancy something sweet with coffee? The hotel usually has 2-3 gluten free cakes to select from. The children's menu can be accommodated gluten free, and high chairs are available, making it an ideal family eating destination.